This brand new 10,000sf lodge-style house offers the ultimate luxury private retreat for family reunions, corporate off-site meetings, and major events of all sorts. 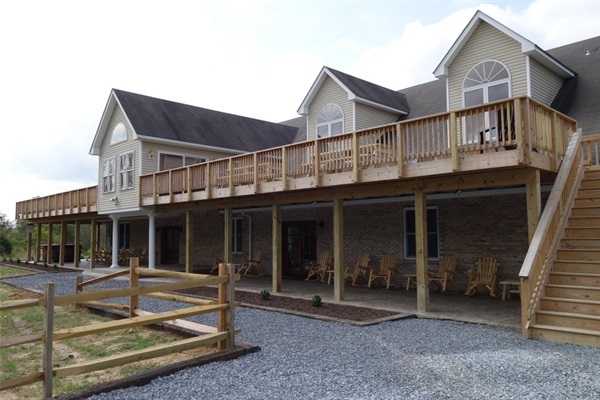 It is built of the finest materials including local stone and hardwood from the property, and gives views of the magnificent Shenandoah mountain ranges. Westcott House is perfect for your large-scale event! (additional fees required). Relax and enjoy a game of poker at the game table, or challenge your friends to a game of pool. There's also a billiard table, piano, and DVD library there for your enjoyment. And a ping pong table has just been added! Can I tour the property before booking it for my event? Please see a list of Tour Dates on our main website here under the Description section.